When flag protests were at their height, many observers both here and across the globe, shook their heads and despaired of Northern Ireland. The US diplomat Richard Haass attempted to broker a deal to settle some of the most divisive issues affecting Northern Ireland back in 2013, but the talks ultimately broke down over the issues of parading, and yes, the flying of flags. Haass tried his best to sound upbeat when he left Northern Ireland, but he looked exhausted and frustrated. How ironic then that the world’s largest democracy is itself now engulfed in a flag dispute that could be, in its own way, every bit of divisive as ours. When nine black worshippers were killed at a church in South Carolina this month, there was outrage that the Confederate battle flag still flew over the state capitol at full mast as the rest of the nation was in shock at a murderous racist attack. When the war was over it was this battle flag that was chosen by veterans and relatives to commemorate fallen comrades, but by the mid 20th Century had taken on a much more sinister connotation. It was used as an emblem of defiance by those southern states opposed to ending segregation and the other reforms demanded by the civil rights movement. That is how it has become associated with racism and, of course, it is often adopted by white supremacist groups. The battle flag has flown over the South Carolina state capitol since 1963. South Carolina was the first state to secede from the Union in 1860 and the first shots were fired there the following year. In 2000 after many protests about its use, a compromise was reached whereby the flag would no longer fly on top of the building, but on a 20 foot pole next to a Confederate monument. Apparently it was not lowered after the murders, because under that same compromise agreement the legislature needs to vote for that to happen. Equally removing the flag altogether would require a two thirds majority. This in a state where the last time a poll was held three quarters wished to retain the flag and thousands turned out to protest against the 2000 compromise. So despite the fact that leading figures from both the Democratic and Republican parties are now calling for the flag to be removed, achieving that might be a little less straight forward than it might first appear. And South Carolina is not the only state affected. 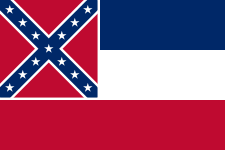 Mississippi’s state flag features the old battle flag in its design, as pictured above, and in Tennessee a bust of Nathan Bedford Forrest, a confederate general and first grand wizard of the Ku Klux Klan is on display in the statehouse. There has been a wave of street protests across the USA calling on those states that still fly the flag to desist and retailers such as Walmart and Amazon have stopped selling the battle flag. There seems to be a growing consensus amongst the American political establishment that Confederate flags should be confined to museums and history books: after all its proponents were fighting for their perceived right to keep slaves and oppress racial minorities. The defence that it actually stands for freedom and liberty and opposition to “Big Government” which is made by those who want to retain it, is hard to reconcile with what Confederates themselves said during the war. Whilst it is instructive to remind ourselves that Northern Ireland is not alone in having flag disputes, it is also very sobering to remember that the American Civil War took place 150 years ago. Nobody is alive today who took part in it, and there will be very few whose parents were alive during it. One side was decisively and permanently defeated. Our conflict is much more recent, there was no clear cut “victor” as such and there are still some very raw issues we are working through. We need to stop being so horrified about the fact that flags and emblems stir the blood, accept that disputes over them will be part of the future too and prepare for that inevitable fact.